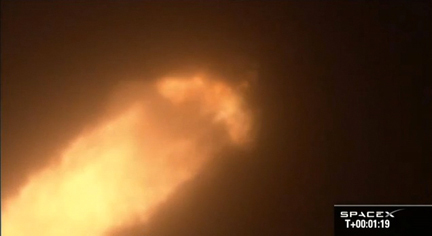 SpaceX engineers are reviewing telemetry to figure out what caused a dramatic first stage engine failure Sunday night during launch of a commercial developed cargo ship on the company's first operational flight to the International Space Station, officials said Monday. The SpaceX Falcon 9 rocket's flight computer fired the remaining eight first stage engines longer than planned to compensate for the failure of engine No. 1 and the Dragon cargo capsule was successfully boosted into the required orbit, setting up a rendezvous with the space station Wednesday morning as planned. The SpaceX launch generated widespread interest because it was the first flight under a $1.6 billion contract with NASA to provide space station cargo delivery and return services as a commercial endeavor, restoring NASA's ability to resupply the lab complex with U.S. spacecraft. The engine shutdown triggered widespread speculation among space enthusiasts, bloggers and reporters because it was apparent something unusual had happened during the Falcon 9's ascent. 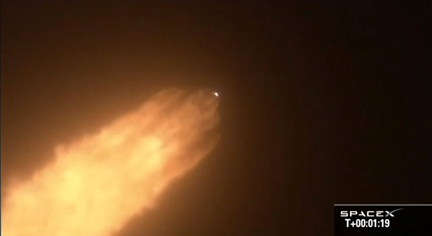 Long-range tracking cameras showed a sudden brightening of the exhaust plume and what appeared to be debris falling away in the rocket's wake. Any problem serious enough to generate debris typically results in a loss of mission. But the Falcon 9 continued its ascent and while it was apparent the remaining engines burned longer than expected, the Dragon spacecraft ended up in the proper orbit. The company issued a press release shortly after launch saying "the Falcon 9 rocket, powered by nine Merlin engines, performed nominally today during every phase of its approach to orbit." But SpaceX founder and chief designer Elon Musk acknowledged the premature engine shutdown in an email to a reporter, saying the Falcon 9, like NASA's Saturn 5 moon rocket, was designed to withstand an engine-out during ascent. 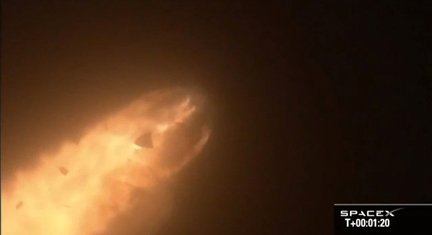 In an update Monday, the company provided additional information, saying the rocket "detected an anomaly" with engine No. 1 one minute and 19 seconds after liftoff. "Initial data suggests that one of the rocket’s nine Merlin engines, engine 1, lost pressure suddenly and an engine shutdown command was issued immediately," the update said. "We know the engine did not explode, because we continued to receive data from it. "Our review indicates that the fairing that protects the engine from aerodynamic loads ruptured due to the engine pressure release, and that none of Falcon 9’s other eight engines were impacted by this event." The rocket's flight computer then recalculated the trajectory and fired the remaining eight engines longer than originally planned to compensate for the loss of engine No. 1. As a result, the update said, "there was no effect on Dragon or the cargo resupply mission." "Falcon 9 did exactly what it was designed to do," the company said. "Like the Saturn 5, which experienced engine loss on two flights, Falcon 9 is designed to handle an engine out situation and still complete its mission." The company said engineers will review flight data "to understand the cause of the anomaly, and will devote the resources necessary to identify the problem and apply those lessons to future flights. We will provide additional information as it becomes available." The Dragon capsule is expected to reach the International Space Station early Wednesday, pulling up to the lab complex and standing by while station commander Sunita Williams and Japanese astronaut Akihiko Hoshide lock on with the station's robot arm. The astronauts then will maneuver the cargo ship to a berthing at the Earth-facing port of the forward Harmony module. While the Dragon spacecraft appears to be on course, the fate of a prototype next-generation Orbcomm messaging satellite was much less certain. The OG2 satellite was attached to the Falcon 9 second stage as a secondary payload under a separate contract between SpaceX and Orbcomm. After the Dragon capsule was released, the second stage was to have fired again to put the OG2 satellite into a 217-by-466 mile high orbit. But the second rocket firing did not take place. "Due to an anomaly on one of the Falcon 9’s first stage engines, the rocket did not comply with a pre-planned International Space Station (ISS) safety gate to allow it to execute the second burn," the company said. "For this reason, the OG2 prototype satellite was deployed into an orbit that was lower than intended. "ORBCOMM and Sierra Nevada Corporation engineers have been in contact with the satellite and are working to determine if and the extent to which the orbit can be raised to an operational orbit using the satellite’s on-board propulsion system."